Frank and Fred Casino will then reward you with a bonus (Welcome Bonus is for new players only). The terms and conditions of the bonuses vary between different casinos and might also change over time and between different countries, so it is important to compare the different offers and read the T&C for Frank and Fred Casino before signing up. 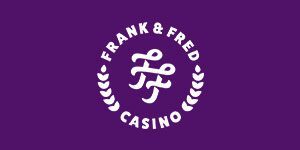 Frank & Fred casino is about to be launched and everyone is looking forward to seeing what this unusual purpleicious brand has to offer. Although the site is yet to go live, we have a pretty good idea about the offerings of Frank & Fred; according to announcements, the website will feature a plethora of games from various providers, bonuses in bulks, a VIP program and a mobile-friendly version, among other things. Presumably, the website will have a Maltese remote gambling license to operate in the announced markets: Bulgaria, Croatia, Germany, Finland, Greece, Norway, Romania and Sweden, among others. Players residing in Australia, France or the United States won’t be accepted, though. People behind Frank & Fred have more than three decades of experience in the business in over 60 iGaming labels, and most of the investors have relevant backgrounds in the business. Undoubtedly, it takes both vision and experience to launch a brand new online casino brand, and these folks have the winning combo. ‘Show me the Moooooney!’ is the brand’s tagline and we’re confident there will be no shortage of entertainment and excitement at Frank & Fred. The layout will undoubtedly be vibrant and lively, and there have been some indications of mild Las Vegas references, as well as shout-outs to the luxurious lifestyle, parties, holiday relaxation and the like. What better environment for an online casino, right? Frank & Fred will include games from dozens of proven providers, with the addition of smaller studios and upcoming brands, covering all game categories and genres. NetEnt, Microgaming, Bally, Barcrest, Iron Dog, Push Gaming, Pragmatic Play, Thunderkick and Rabcat are just the tip of the iceberg. For the live casino section, Frank & Fred has secured products by Evolution, NetEnt Live and Extreme Live Gaming, and there will also be some compelling lotto games included such as Powerball, Dino Lotto, Euro Millions and Mega Millions. Judging by the names, Frank & Fred will be overstacked with premium slots, ‘millionaire maker’ jackpots, fine card games/roulette versions and lustrous live dealer tables. We couldn’t ask for more. Since slots make up the largest portion of the portfolio in over 90% of the cases when it comes to online casino sites, this will almost certainly be the flagship of Frank & Fred Casino. There isn’t a doubt in our minds that mega popular video slots such as Starburst, Gonzo’s Quest, Immortal Romance and Guns N’ Roses will be featured in the library, as well as some of the distinguished titles from the rest of the providers. There’s Titanic from Bally, Monopoly and Rainbow Riches series from Barcrest, as well as Esqueleto Explosivo and Fruit Warp from Thunderkick. A galore of fantastic features, bonus rounds and immersive stories is guaranteed. A fair number of mentioned game producers can deliver classic casino tables and tables with a range of side bets. Although it’s unsure which ones will contribute in this department, we can hope for Microgaming’s Texas Hold’em, Triple Card Poker, Pai Gow Poker and Caribbean Poker to make the cut, as well as European Roulette and Multi-hand Blackjack. For now, only lottery games are confirmed, but we have yet to receive information whether any virtual scratch tickets will be available. Hopefully, bingo fans will have something to try out at Frank & Fred, and video poker has no reason to be excluded from the selection. But, there’s no way of knowing until the site goes officially live. The live dealer will be a rich category at Frank & Fred. NetEnt alone offers exquisite Live Roulette, Live Blackjack and one-of-a-kind Live Common Draw Blackjack. With additions from Evolution (Lightning Roulette, Immersive Roulette, Dream Catcher) and Extreme Live Gaming (Sizzling Hot Roulette, Live Baccarat) there will be more than enough tables to support Frank & Fred live dealer customers. All payments at Frank & Fred will go through trusted methods already widely used in the online world. Starting with Visa and MasterCard the majority of the clientele will have no trouble funding their accounts; the list continues with Trustly, Zimpler, Skrill, Neteller and PaysafeCard. By the looks of it, the primary currency will be the EUR, with SEK and NOK deposits also accepted. Brand operators have stated that there will be no fees included, but the minimal and maximum amounts set for depositing and cashing out may differ depending on the chosen method of transfer and country of residence. Friendly all the way, Frank & Fred Casino provides a dedicated customer care service to its visitors in several European languages (English, Swedish, Norwegian and Finnish). The online chat is available to address customer queries from 09:00 to 00:00 CET, while the alternative is email support, whose response time may be a bit longer.